Given that much of my focus around Cloud Computing is the fact that Cloud enables smaller businesses to achieve a level of service formerly only available to the largest enterprises, it always piques my interest when something SMB related crosses my desk. 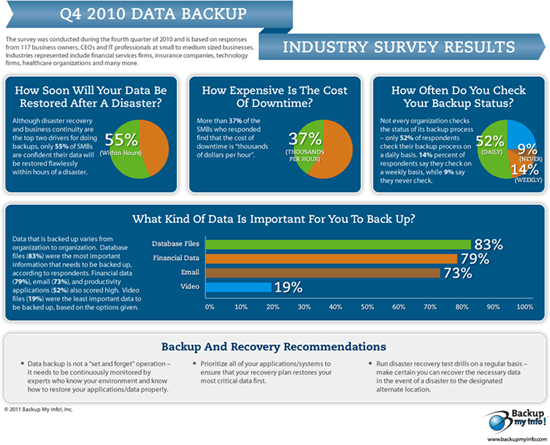 Case in point: a recent industry survey conducted by BackUpMyInfo (more on them here), a boutique SMB backup company. The survey asked respondents a number of questions relating to the impacts of downtime for their organizations – and assesses such things as expected recovery time, the estimated cost of downtime, they types of data that organizations consider important to backup etc. Disaster recovery and business continuity are key drivers. Disaster recovery (89%), business continuity (73%) and security (52%) were the most common reasons to backup a company’s critical data. Comparing recovery time for critical data versus non-critical data. Most organizations (40%) believe that “within four hours” is an acceptable recovery window (the time it takes for your recovered data to be accessible) for critical data. However, in terms of non-critical data, the majority (42%) believe that one business day is an acceptable timeframe. Not every organization checks the status of its backup process on a daily basis. Only 52% of respondents check their backup process on a daily basis. Fourteen percent of respondents say they check on a weekly basis, while 9% say they never check. Technical service and support is more important than price when selecting a backup vendor. Seventy-nine percent of respondents believe that technical service and support are more important than price (60%) when selecting a backup vendor. Data security (72%) and speed of recovery (61%) also scored high as important decision criteria. Data that is important to backup varies from organization to organization. Database files (83%) were the most important information that needs to be backed up, according to respondents. Financial data (79%), email (73%), and productivity applications (52%) also scored high. Video files (19%) were the least important data to be backed up, based on the options given. It’s an interesting conundrum that, as disaster recovery and backup solutions become cheaper and more accessible, yet still organization have a mentality that sees them ignore this critical part of their business. Having come through a natural disaster recently, I’ve seen first hand how having accessible data – no matter of location or status of physical equipment – is a critical part of business continuity. While clearly the survey was aimed in such a way as to justify the use of BUMI’s own service, outside of that it is an interesting glimpse into the realities for SMBs – it is important that IT organizations selling into this market properly articulate the fact that backup, and the ongoing checking that backup and DR processes are in fact working, is a critical task that organizations need to remain on top of. The survey results have been turned into an infographic, see below. Ben, I remember auditing a site, a medical practice of all things, and having to tell the boss that the previous IT service provider had botched the job and that their backups weren’t working and there hadn’t been a backup of anything including patient data for several months. Need I say more! Yes and enterprises still don’t get it right either!